Welcome to “Italy Rewind,” our player-by-player recap and video feature from Michigan’s four-game tour of Italy. 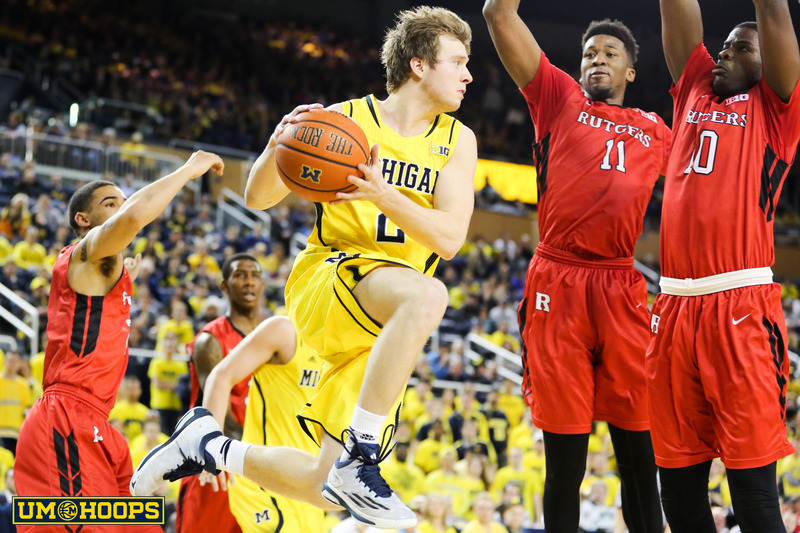 Today we take a closer look at Michigan freshman Ricky Doyle. All eyes were on Michigan’s big men in Italy. With Max Bielfeldt and DJ Wilson sidelined, Michigan only had two options at the five position overseas and neither player has ever played in a college game. Mark Donnal and Ricky Doyle got plenty of work in Italy, splitting the available minutes at the five position throughout the trip. Donnal was the starter in all four games, but Doyle usually started the second half. Both players had their moments, but it was Doyle that finished the tour as Michigan’s No. 3 scorer and leading rebounder with averages of 11.5 points and eight rebounds per game. Doyle was held to zero rebounds in the first game of the tournament and the resulting film session with Bacari Alexander had a singular focus: rebounding. Alexander’s lessons worked and Doyle averaged over 10 rebounds per game in Michigan’s final three contests. He posted two double-doubles on the trip and was one of the most pleasant surprises overseas. He’s not going to average close to a double-double during his freshman season, but Doyle showed flashes of what he’s capable of. Doyle plays big and isn’t afraid to use his size to push around smaller defenders. What stands out about his performance early on is his feel for the game offensively. He does a good job of catching and finishing (74% on twos in Italy) around the basket and generally uses the right footwork while keeping the ball high. These seem like little things right now, but they will be critical as Doyle continues to adjust to the pace of the game. Despite his big week in Italy, attempting to define expectations for Doyle this season is still tricky. He didn’t play AAU basketball in high school, a decision that limited his national exposure, and he played in a lower level high school league. Doyle was always productive in high school, and now in Italy, but will he be ready to battle in the Big Ten? He’s done everything in his power to make sure he is. When Doyle graduated high school in May, the first thing he did was head to Ann Arbor and start to prepare physically for the college game. He shed body fat – down to 12% from 18% – and he added muscle during offseason workouts with Michigan strength coach Jon Sanderson. His physical transformation from the end of his senior year is obvious on film. Despite Doyle’s productive summer, there are still plenty of questions for Michigan’s frontcourt. The Wolverines weren’t playing giants or battling against Big Ten caliber opposition. Michigan only faced one frontcourt that was formidable and the Wolverines struggled to slow them down. Mantova’s duo of Johndre Jefferson (6-foot-10) and Armin Mazic (6-foot-7) both scored 18 points in the final game of the tour. Jordan Morgan or Mitch McGary aren’t walking through the doors of the Crisler Center any time soon and Michigan is going to have to find options defensively. Doyle can provide a lot — strength, physicality and a feel for the game offensively – but Michigan is going to need to find consistent defensive performances out of Doyle, Mark Donnal, DJ Wilson and Max Bielfeldt.